On this week’s edition of the email marketing news digest we’re looking at what the experts have to say on the do’s and don’ts of email segmentation. We present the views, so you can do your own testing to see what works best for your business! And for the email segmentation experts out there, we’ve kept it diversified with tips from mobile marketing and study results on the industry performance of email marketing. While the previous article gives a good overview of basic email segmentation practices, Jordie van Rijn provides examples where it’s okay to make an exception, or to go one step further in ensuring your email is both relevant and targeted. Early segmentation – Sometimes it’s best to put off collecting customer preferences to make email sign-up less painful. Instead, go for a customer preference center. Age & behavior – Don’t make assumptions about age group. For example, just because you are targeting baby boomers doesn’t mean you don’t need an email that is optimized for mobile. Gender segmentation – Remember that during the season of giving, people might purchase something on your site for the opposite gender as a gift. Geographic location – Rethink the way you present content to a national audience if you segment by geography. Be creative! We’re all about multi-channel these days so we might as well apply that to our marketing tactics as well! 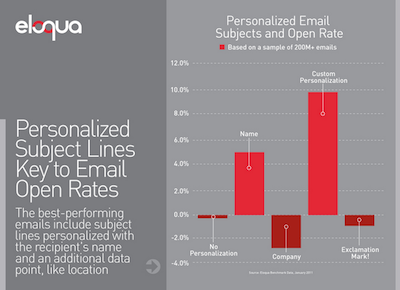 Our client Eloqua has gathered data revealing that personalized subject lines are key to open rates. Email subject lines that contain the name and one other personal detail perform the best. Here are 5 other tips to boost your open rates. Think you’re good at email marketing? Here’s an infographic to give you some insight on how you compare in the industry (or in UK at least). Looking for a digital messaging software with built-in functionality to segment lists for behavioral marketing? Read more about Momentum. Wow very informative article! I’m excited about this SMS or mobile marketing technique. This will help you increase repeat business, drive new customers to your website and for every text inquiry; the dealer generates A Real-Time Lead.